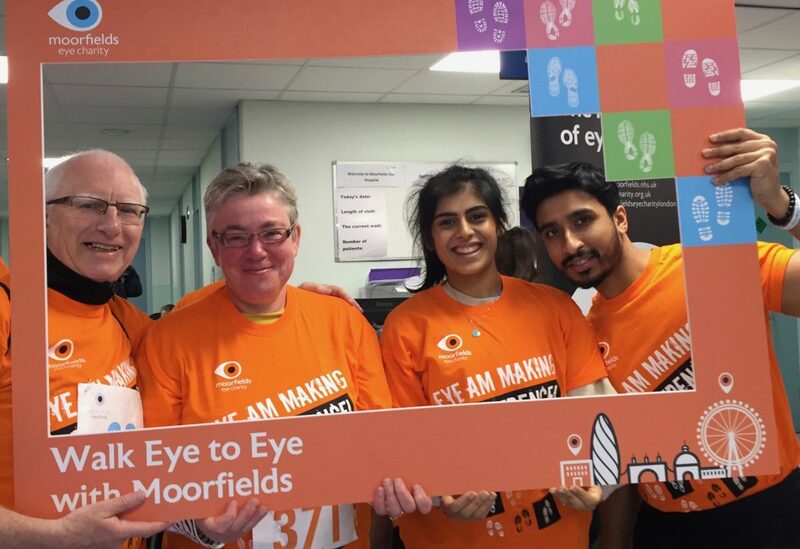 Fight for Sight is working to raise awareness of the importance of eye donations after research has found that eyes are the organ that people would be the least likely to donate following their death. 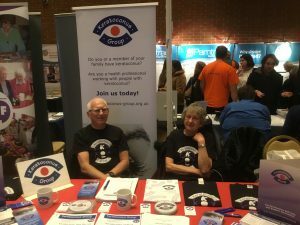 The eye research charity has highlighted that there is currently a shortfall in corneas that can be used for transplant, with statistics released by NHS Blood and Transplant this month reporting that there are currently 279 corneas in eye banks, despite the target being to have around 350 at all times. 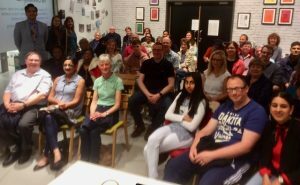 Our well attended, AGM was held on 23rd March 2019. Three new committee members were appointed namely, Batcho Notay, Caroline Condillac and Jacqui Thomas. Moira O’Brien resigned for health reasons. 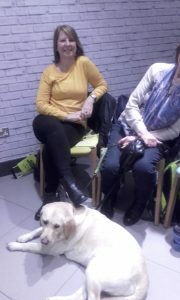 The meeting paid tribute to Moira who has been a supporter of the KC group since its inception. Click here to see a full list of officials. 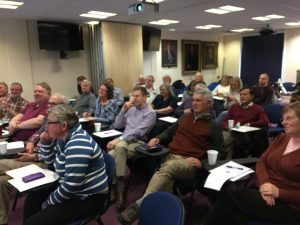 The meeting was followed by a fascinating talk by Alison Hardcastle, Professor of Molecular Genetics at the Institute of Ophthalmology Faculty of Brain Sciences, who spoke about the Moorfields genetic study. We had an encouraging start with our inaugural meeting on 9th March. Mr Mayank Nanavaty spent an hour talking through the different scenarios facing a typical (if there is such thing) Keratoconus patient. Outlining the various treatment options. He also updated us on the latest Laser equipment and surgical developments. He made sure everyone had the opportunity to ask questions and answered them fully. We hope this will be repeated in the autumn or next spring and with more local advertising, this should prove a worthwhile patient group. 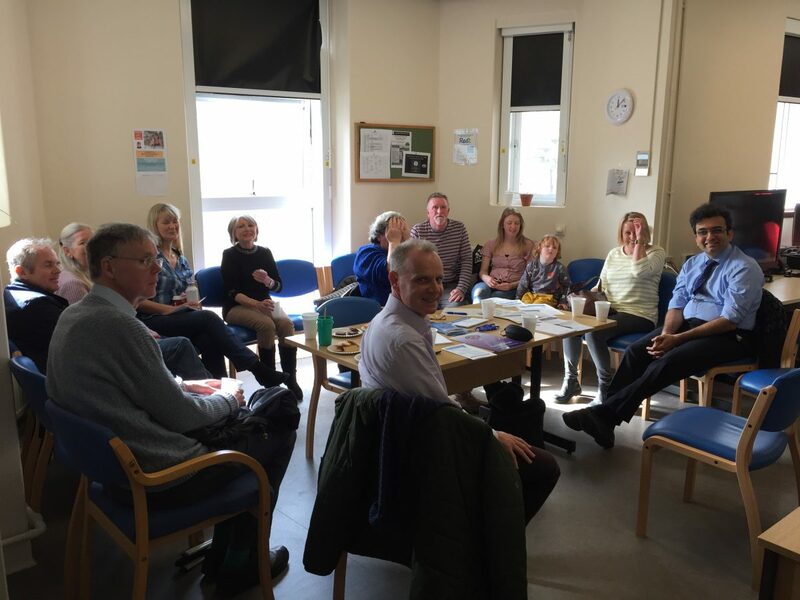 The next West Midlands branch meeting of the Keratoconus Group will be held on Saturday 10th August 2019 at 11am. The venue is the John Lewis Birmingham Community Hub GRAND CENTRAL above New Street Station. Go to the 4th floor, turn right at the top of the escalator, in the corner on left by Audio & TV. Those of you at last year’s conference may remember that Professor Rubinstein was in the audience with two of the Conference speakers paying tribute to him; so this should be a very good talk. All welcome, whatever your history of KC. FOR FURTHER DETAILS Please ring John Thatcher: 01743 625138. New members are welcome. Hope to see you there. Feel free to drag and zoom the map below. 12th October – Where Ash Winter will give his personal account as someone affected by KC who self-published a short book about his story. 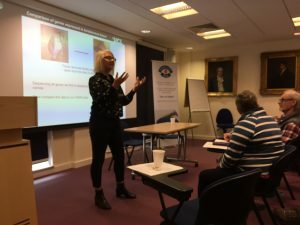 The videos taken at the 2018 KC Group Conference held in Birmingham in September are now online and ready to view. They can all be viewed on the video page in postage stamp format, and you can click the icon on the bottom right of each video to make it full screen for easier viewing. The videos are also available on our YouTube channel. For many years, it’s been long stated that keratoconus occurs in one person in every 2,000. In an article published in March 2017, the American Journal of Ophthalmology, Dr. Daniel Godefrooij, from the University of Utrecht, refines our understanding of incidence and prevalence of KC(2). We had another great 14 mile walk through London. Not as green as last year but architectural interesting and physically challenging, walking to Islington, Camden, then looping past Hampstead Heath, up to Belzise Park and Primrose Hill. The second half took us around regents Park then through Hyde Park and St Jameses Park. We finished with refreshments in the old County Hall building. Here is our report from March 2018. 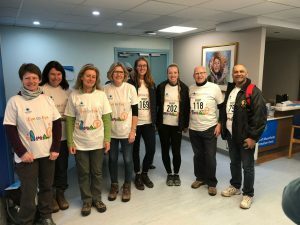 Eight of us formed the KC team among the 500 walkers. We gathered in front of the piano in Moorfields reception for this photo ready for our 14 mile track. After two of the coldest days in decades, the sun came out to send us on our way. It was a bright crisp morning with plenty of ice still floating on the canal. The route was perfect, we all found parts of London we had never seen before. It traced the Regents Canal, with a few detours through places of interest, to Little Venice. Then turned south to Paddington for our half way stop. The second section took us through the royal parks and theatre land. The temperature was ideal for walking, as was the company. We were so busy chatting that the miles flew by and after 5 hours we had completed our task and settled down to coffee, cake and a steel band. This is an annual event and I thoroughly recommend it for next year. We raised well in excess of £1,000 and are overwhelmed by the generosity of friends and family. One hiccup, we were so busy talking about the Royal Opera House that we missed the 1/2 mile loop around Lincolns Inn, but don’t tell anyone. 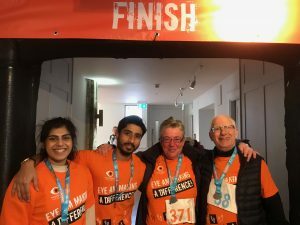 We are pleased to announce that we have entered in to an agreement with Fight for Sight to support an award up to the value of £15,000 to fund research into the condition Keratoconus. The Award will be funded as to 50% by Keratoconus Group and 50% by Fight for Sight. We can now announce that the funding has been awarded to a team led by Dr Mouhamed Al-Aqaba at Nottingham University . The project is titled – “The involvement of corneal nerves in the pathogenesis and progression of keratoconus”. The research team has already identified that corneal nerves are dramatically altered in KC and will now be looking at whether these changes have a relation to the severity and progression of KC and identifying the types of nerves involved. This promises to increase the understanding of the condition, and may eventually lead to new interventions. 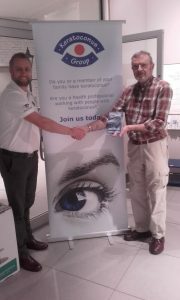 See the Press Release on the Fight for Sight Web Site. This is an exciting adventure made possible by the generous sponsorship of Barbican Insurance. What a wonderful evening. An intimate setting with a glass of wine. Perfect lighting bringing her sisters paintings to life. 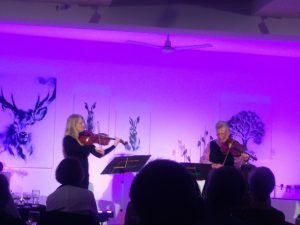 Australian viola player Michelle Urquhart and her friend Marco van Pagee gave a delightful solo viola and viola duet recital. Michelle is the NSW representative for Keratoconus Australia and all proceeds from tickets/donations will come to the KC Group to be used for research into KC to benefit those with KC worldwide. “It was whilst studying music at the Sydney Conservatorium that Michelle’s eyesight started to fail. She underwent her first corneal graft. It failed, and for four and a half years she was legally blind. Following serious eye infections and rejection she underwent an emergency graft.